It is speculated that the Norwich Terrier was developed using the small Irish Terriers and crossing them with other Terrier breeds, including the Border and Cairn. The breed originally had two varieties, one with drop ears and one with prick ears, which were interbred and shown together. 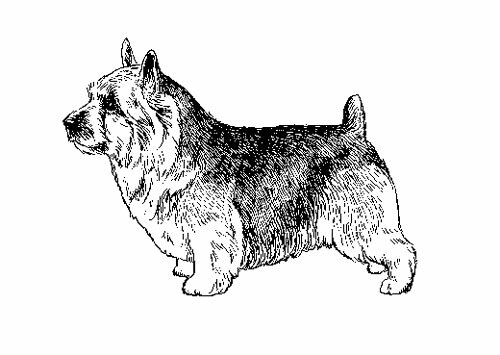 The two varieties were eventually designated as separate breeds, the original, prick-eared variety being the Norwich Terrier, and the drop-eared variety being the Norfolk. The Norwich Terrier was recognized by the United Kennel Club in 1979. The versatile, agreeable, game, hardy Norwich is one of the smallest of the working Terriers. It has a natural, weatherproof coat and is sturdy, with good bone and substance. The breed is fairly low to the ground and compact. Honorable scars from fair wear and tear are acceptable and never to be penalized in the show ring. All faults are to be penalized in relation to the degree of deviation from the ideal. The Norwich Terrier is characteristically alert, affectionate, fearless and loyal, never aggressive. It has sensitive prick ears and a slightly foxy expression. Spirited and stocky, they are one of the smallest working Terriers. The broad, slightly rounded skull has good width between the ears. The length of the strong, wedge-shaped muzzle is one-third less than the distance from the occiput to the well-defined stop. The jaw is clean and strong; tight lipped. Lip pigment is black. A full complement of strong, white, large teeth meet in a scissors bite. The small, dark, oval-shaped eyes are placed well apart. They have black rims. The eyes have a bright, keen expression. The erect, medium-sized ears are set well apart. They have pointed tips and are carried upright when alert. The strong, medium-length neck blends into well laid back shoulders. The legs are short, straight and powerful, with strong pasterns and elbows that lie closely to the ribs. The chest is broad and deep. The back and loin are short, with well-sprung ribs that carry well back. The topline is perfectly level. The hindquarters are strong, with broad, muscular thighs. The hind legs are short and powerful, with well-turned stifles and low to the ground hocks. The feet are round, with thick pads and strong, black nails. They point straight forward when moving and standing. The tail is generally docked to a medium length, set on high with the base level with the topline. It is carried erect. The protective outer coat is hard, wiry and straight and lies close to the body. It is about 1½ to 2 inches long. There is a definite undercoat. The protective mane on the neck and shoulders is longer and forms a ruff at the base of the ears and throat. The legs have moderate furnishings of a harsh texture. The hair on the head, ears and muzzle is short and smooth, except for slight eyebrows and whiskers. They are shown with as natural a coat as possible. Some tidying is necessary to keep the dogs neat, but shaping is to be heavily penalized. All shades of red, wheaten (pale yellow or fawn), black and tan, or grizzle (bluish gray or roan) are permitted. Ideal height, measured at the withers, is 10 inches. Ideal weight is approximately 12 pounds; should be in proportion to the individual dog's structure and balance. Fit working condition is of utmost importance. Gait is true, low and driving. The topline remains level. The legs move parallel, showing great power of propulsion. In the forequarters, the legs move freely, with the feet and elbows the same distance apart. The good rear angulation exhibits a true, driving movement. When viewed from the side, the hind legs follow in the track of the forelegs, moving smoothly from the hip and flexing well at the stifle and hock.